When I started writing at BullionBaron.com in 2010, more than anything it was a place to collect my thoughts. I was often commenting about finance / property / precious metals across various forums and found myself repeating many of the same points, so the blog was a way of centralising these ideas for reference. Later as my readership increased it became a platform to share my ideas, investment decisions, opinions and research. Looking back at some of the posts, there were many predictions made, many terribly wrong, some very right. I hope I provided interesting commentary that prompted you to think for yourself and consider the role alternative assets might play in your portfolio. A lot of my spare time over the past couple of years has been absorbed by a startup I co-founded (not related to the topics I write about here). It's not likely that my time will free up to come back and write again in the foreseeable future. Over the last couple of years I have posted much less regularly and at this point it has been ~9 months since my last post. I won't rule it out, but it is unlikely this site will see a resurgence of posts (even with the return of a bull market in precious metals), so I have decided at this point to retire it. I am not sure what that means just yet, I might make the entire blog private or I might unpublish posts that are irrelevant or that I disagree with today and leave up some of the timeless pieces. This will likely occur within a few weeks. I expect to continue tweeting from @BullionBaron, so feel free to connect there. I am considering to drop the pseudonym and tweet under my real name sometime soon. Disclosure: Most articles which publish 'reviews' of a MLM scheme are in fact not honest, but rather a sales pitch dressed up as an independent article. This is not the case here. You will not find any referral links (hidden or otherwise) to USI TECH in this post. I have no problem with people advertising a service or product that they don't own and taking a cut, referral fee/bonus or affiliate commission when a genuine product is being sold and the process is fair and transparent. This is typical in the sales industry. There are some multi-level marketing (MLM) sales systems which take this a step further and allow you to not only take a single cut of a products sale, but also allow you to bring in other participants where you would take a small cut of their sales too and of those they recruit (typically receiving a smaller share with each level down the chain). At this point such a sales system can start to become risky and detrimental to the end buyer. The more people who are receiving a cut, the more profit you need to pad into the price. So chances are the end buyer is not receiving a very good deal if the cost of the product they purchase is paying a commission to a number of parties further up the chain (see image above). 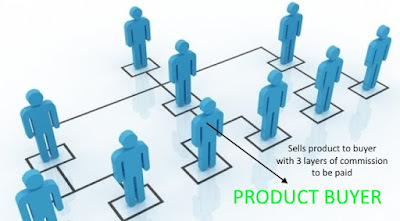 Also the end buyer is often recruited into the structure to try and sell the product themselves. It is not very different to a pyramid scheme, however there is a product or service involved even if it doesn't represent good value. Have you heard of cryptocurrencies (referred to from here on as cryptos)? Their performance can be very volatile with regular 30%+ falls. Exchanges have collapsed taking investor funds with them. Code has gone wrong making it impossible to sell cryptos in a wallet. If you forget your private key the value is lost forever. Many of them are poorly coded or offer no real advantage over their peers. And this is barely scratching the surface of the risks involved with buying or owning them (though I do believe the technology will be used in everyday life down the track, so there are reasons to speculatively own some). 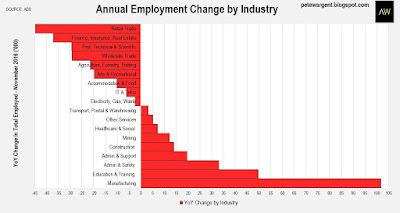 Now imagine an MLM sales system was applied over the top of this highly speculative financial sector (cryptos). 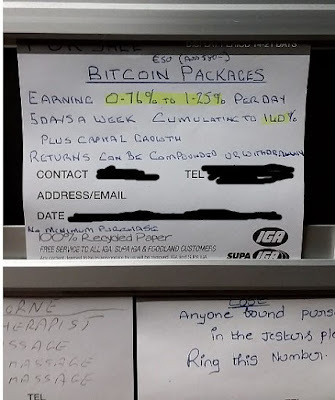 There are a number of 'opportunities' popping up in this space (another example is BitConnect), including one that seems to be increasingly popular in Australia, USI TECH. I have now been approached by at least half a dozen individuals to check this out and thought I'd take an opportunity to share some research I have done and my thoughts. I also welcome your comments below if there is anything I have missed or misrepresented (I am only using publicly available information). Typically such a return would be indicative that it is a HYIP (high-yield investment program), basically a type of ponzi scheme. It is very unlikely they will be able to return such a consistent figure over the long term. There is no magic automatic trading system that can make you a fortune like this. In fact, Bitcoin has actually risen 6 fold since they launched their Bitcoin packages, so chances are you would have outperformed their system simply by buying and holding Bitcoin directly (at least over the last 9 months). 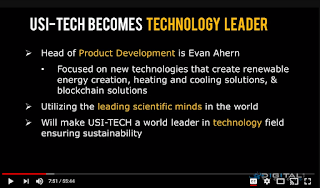 USI TECH attracts people to this platform not only through the return, but also by offering very attractive commissions to those who want to sell these Bitcoin packages (and a recently announced 'token') to others through their referral system. The token they are selling is dubious at best. They intend on turning the token into an ICO (initial coin offering) in the future. They have dubbed it TechCoin (Code: UTC), despite there already being a crypto by that name and another using that code. Typically when an ICO launches they will release a whitepaper beforehand, which will detail how they intend on spending the funds, why their particular brand of crypto is superior or what it is for. 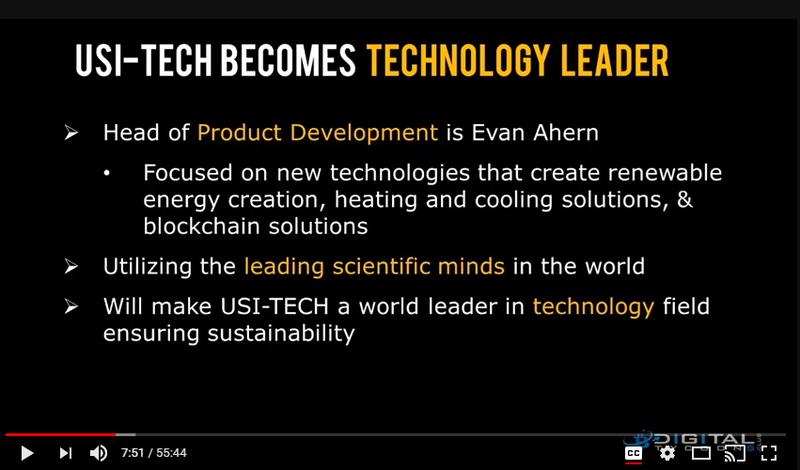 To date there has been no whitepaper released publicly by USI TECH. I read they were going to release it after 500 million of their tokens are sold... why wait? Why would anyone buy this token without understanding any value it provides or what it will ultimately be used for? The way they have structured the token sale is to incentivise both a large purchase by the buyer as well as for the referrer to push for large sales as they receive higher commissions. 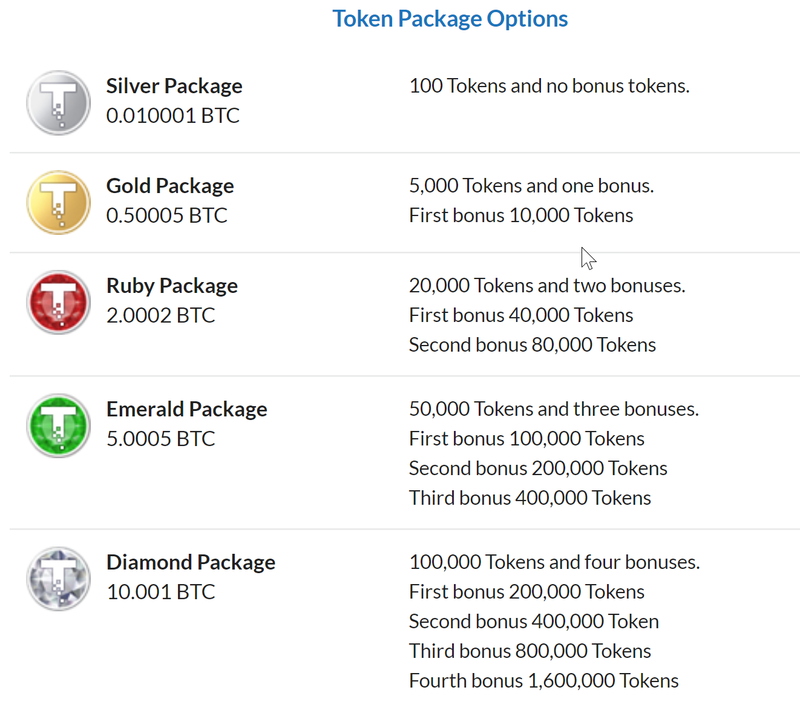 The largest package you see above is Diamond for a cost of 10 Bitcoins (roughly A$109,000 at today's price). Being presented by people who simply don't have the qualifications or public history to confirm they know what they are talking about. "Jao Severino (JOÃO FILIPE FERNANDES SEVERINO) has been barred from financial activity in Portugal because he was involved with another scam called AMC INVEST. AMC Invest offered 10% interest per month on investments and it ended up scamming hundreds of people before it was taken down by the authorities. People were arrested for this scam." * As far as I can tell the people involved don't have the appropriate experience (e.g. equipment rental manager presenting ‘revolutionary power technologies’) or have been involved in HYIP/pyramid schemes in the past. * They have made outrageous claims about the technology they own... think about it, if they really had a machine patented to reduce the cost of electricity for crypto mining as they've described, why would they waste their time with doing so when it would have real world applications that could be worth a lot more. * They're selling tokens which will eventually be exchanged for coins.. so they say. Which exchange is going to accept them? What real value will these coins provide? How does it differ to other crypto out there? Which reputable crypto specialists do they have designing the coin? Where is the whitepaper? * They are promising returns that simply can't be replicated over the long term. My expectation is that they are paying out any current returns from new investors' money or from money collected from selling the tokens and from their mining rigs. They are probably relying on a lot of investors "reinvesting" their returns. These schemes (HYIP) can operate as long as they have enough new money coming in to cover any money going out. If the incoming money stops/slows, it will eventually collapse. 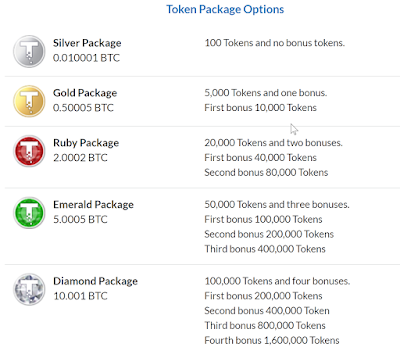 * The smallest Bitcoin packages are not that expensive, but this TechCoin is trying to bring in investments of tens of thousands of dollars through the way they have structured the bonuses. Why are they using this patented power technology for such a low potential opportunity, why not just sell it for billions of dollars if it works as they describe? Why can't they release the whitepaper for the ICO before launch like any reputable crypto operation? What are the names of the crypto specialists working on TechCoin and how can they be contacted? When can we expect an external audit of the trading they are doing? USI TECH is likely to go the way of the last ponzi I covered on this site, Royal Silver Company. Buyer beware. The comments section at MacroBusiness, once a lively space for robust economic discussion, now often acts as little more than an echo chamber. If the response from readers is strong enough in disagreement with the site authors, then those commenting are belittled and ignored (as I wrote in MacroBusiness Persists with War on Cash in Australia). If there is an alternative view or statistics put forward which don't fit the MacroBusiness narrative, then they are ignored, name calling begins or in some cases the comments are edited or deleted altogether. The most recent example of the latter was in the comments section of their recently released report 'Can the great “can kick” save Australia?' (paid subscriber only content). 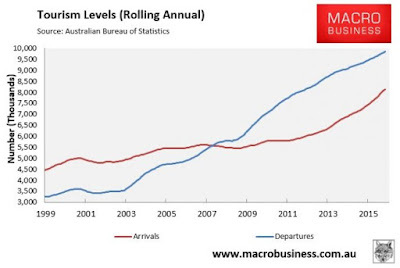 Basically the report amalgamates a range of charts and narrative which supports an outlook that several dark clouds on the horizon (end of car manufacturing, slow down in construction and mining, etc) will converge in a short space of time and crater Australia's economy. They have been writing to this script for a number of years now, slowly pushing out the timing as unexpected economic circumstances have impacted their predictions. My original comment (first screenshot above) was later deleted along with a number of replies. 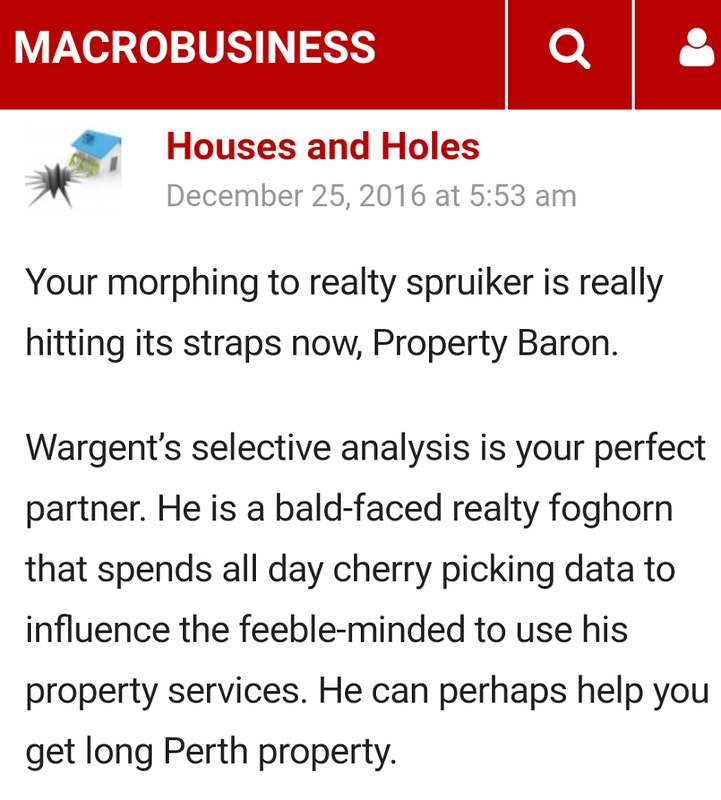 It's a real shame that the editors / owners of MacroBusiness feel the need to use personal insults and name calling to push their agenda. It's also ironic that they attack others for 'selective analysis' while censoring current or potential future positive economic developments (that they've ignored in their own analysis) from being posted in the comment section of their site. Note: A number of my comments have been edited and/or deleted recently on MacroBusiness. To date I have only noticed edits which remove part of the content rather than add to it (this can still distort context). Be skeptical of my comments there if something looks amiss or I don't respond to your replies. You can always reach out via Twitter or email. 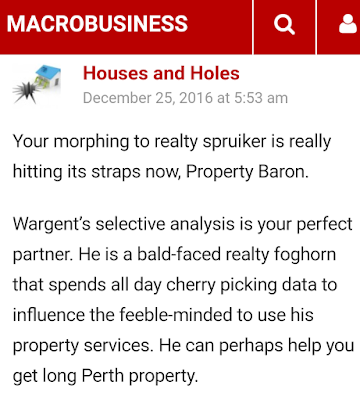 I'm a regular reader, subscriber and intermittent commenter at MacroBusiness (less frequently since my comments started getting trapped in their spam filter or outright deleted when disagreed with). They often produce well thought out arguments on finance and economic topics, which aren't being covered adequately by the mainstream media. "Personally I believe Australia should phase-out both $50 and $100 notes. We are turning into a cashless society anyway, so phrasing-out these bills wouldn’t create much of a burden to the ordinary law-abiding person." The article included a quote from UBS analyst Jonathan Mott, "Removing large denomination notes in Australia would be good for the economy and good for the banks" and this corker from Peter Martin, "Phasing out high denomination notes would be painless, for those of us with nothing to hide" (eerily similar to a quote often attributed to Nazi propagandist, Joseph Goebbels). Leith's response in the comments included praising India for their recent demonetisation of "large" denomination notes (value of which are in the vicinity of A$10-20), calling those who disagreed with him tin foil hatters, suggesting that removal of the $100 note would "certainly interrupt the black economy" and finally bowing out of the comments without addressing many of the valid arguments raised by his readers. I had considered writing this post after this first article, but thought I would give Leith the benefit of the doubt, perhaps his brain fart would not be repeated and he would not broach the subject again. I was wrong. In the last week Leith published a follow up article supporting comments from Kelly O’Dwyer (oft referred to as Kelly O'Liar in MacroBusiness headlines when she says something they don't agree with), vilifying the $100 note. Leith failed to address any of the reasoned comments which followed his last article. "What on earth is wrong with people holding cash if they choose to? As many have noted – criminals will readily find some other way of settling their transactions. Opposition to cash usually boils down to the latest efforts by the private banks and their minion neoliberal cheerleaders wishing to extend the already virtual private monopoly over money creation to a complete monopoly." "I’m still in Vietnam at present and took cash with me to exchange while here for spending money. Every money exchanger I have come across has $100 notes, I only brought $50 notes as I withdrew them from the ATM. How many other money exchangers and foreign banks have pools of Aussie $100 for exchange purposes across the world? Maybe instead of blaming criminals they should be considering this?" ..liaison with major cash industry participants indicates that increases in overseas demand are a fairly usual occurrence when the Australian dollar depreciates. 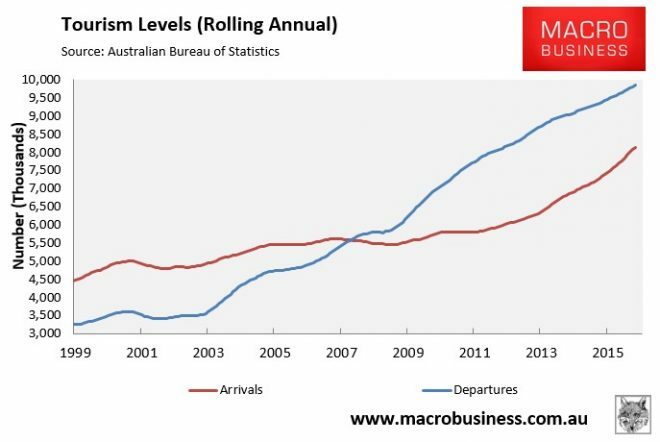 Part of this demand is likely to stem from the increased attractiveness of Australia as a destination for tourism and education, with both of these groups of visitors tending to be large users of cash. A potential source of currency demand that has attracted international attention recently is the use of cash, particularly high-denomination banknotes, to avoid reporting income to the authorities, or to finance illicit activities. Cash may be valued by those engaged in such activities because it is anonymous and untraceable. By definition, however, this also means that it is not possible to assess the demand for cash for these purposes accurately. As noted, it is not possible to estimate the extent to which cash, or any particular banknote denomination, is used in illegal activities. However, liaison with AUSTRAC (Australian Transaction Reports and Analysis Centre) and the Australian Crime Commission suggests that it is the $50 denomination – rather than the $100 – that tends to be preferred by criminal elements because of its ubiquitous use in legitimate transactions. This suggests that to the extent that the $100 banknote is being used for nefarious purposes, any phase-out may not be particularly disruptive to those engaged in such activities. This directly contradicts Leith's claim that getting rid of $100 notes would "certainly interrupt the black economy". And if you thought about it rationally, a lot of the transactions occurring to avoid tax (e.g. tradies performing 'cashies') or buy illegal goods would continue unimpeded using smaller notes as the transaction would typically be only a small handful of notes regardless of whether using $50s or $100s. Demand for cash in the economy stems from its roles as a means of payment and a store of value. As a means of payment, cash has a number of attributes that may be valued by end users. It has near-universal acceptance, facilitates simultaneous exchange and instantaneous settlement, is convenient for person-to-person payments and can still be used at times when electronic payment methods are unavailable due to internet or electricity outages. Cash transactions are also anonymous and, with low rates of counterfeiting in Australia, fraud may be less of a concern than when using alternative payments. Cash can also be used as a store of value and, for this purpose, its attributes come to the fore in times of economic/financial uncertainty. In particular, in circumstances in which the viability of banks is under question – as was the case in many countries during the 2008–09 financial crisis – cash may be considered a superior store of value to money held in the form of bank deposits. That is, claims on the central bank are preferred to claims on a commercial bank. Negative nominal interest rates, especially if persistent, are already problematic. Quite apart from the problems they generate for the financial system, they can be perceived as a desperate measure, paradoxically undermining confidence. Getting rid of cash would take all this one big step further, as it would signal that there is no limit to how far into negative territory nominal interest rates could be pushed. That would risk undermining the very essence of our monetary economy. It would be playing with fire. Also, it would be quite a challenge for communication, even in simply economic terms. It would be like saying: "We want to abolish cash in order to tax you with lower negative rates in order to - tax you even more in the future." Inconvenience those needing to use cash regularly in transactions, a majority of which would be conducted legally. And all despite lack of evidence or reasoned argument that doing so would reduce the so called "black economy". The team at MacroBusiness need to think this one through a little better. 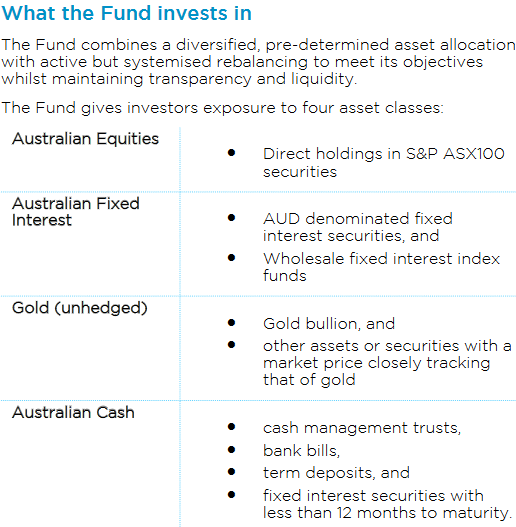 I have written on gold exposure in superannuation without the need for a Self Managed Super Fund (SMSF) in past articles here, for example some funds allow direct equity investment. IOOF Employer Super (previously know as Spectrum Super) is one such fund and has a fairly extensive list of direct shares and securities (including gold miners and PMGOLD). As mentioned in a recent post I have added gold related positions to my super the last couple of years with Silver Lake Resources (SLR), Medusa Mining (MML), Norther Star Resources (NST) and since then Regis Resources Limited (RRL), but not everyone wants to expose themselves to the risks associated with miners. Not everyone wants a level of involvement in their super investments such as that which is required to pick miners or work out what allocation they should have to gold. "The Permanent Portfolio is an investment strategy developed by Harry Browne in the 1970s that advocates splitting your money equally across four assets – cash, gold, equities and bonds – and rebalancing back to that split whenever they diverge too much. Mainstream financial planners would probably balk at a 5% allocation to gold, let alone 25%, but how does such a strategy perform in reality and could you get your financial planner to consider it? 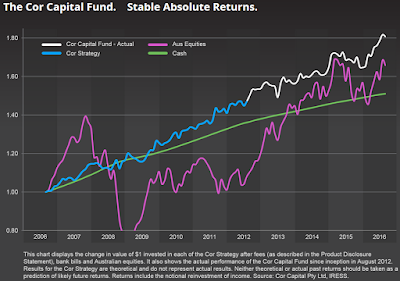 For Australian investors hard numbers on the Permanent Portfolio strategy can be found by looking at the Cor Capital Fund, run by Davin Hood. His latest Quarterly Report is out and his fund’s performance, as summarised in the chart below, I think justifies giving the strategy some consideration." 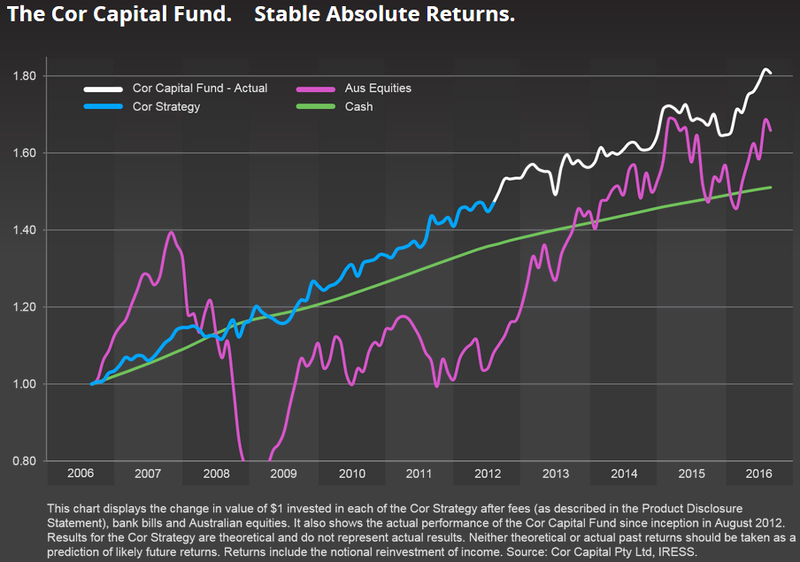 "It is important to note that the blue line is the theoretical performance of the strategy before the fund started and the white line is its actual performance. What is clear from this chart is the low volatility of the fund’s performance – yes, you don’t get big gains (as the Australian Equities line shows in 2006 & 2007) but nor do you get the big losses (as happened in 2008). For those looking for a consistent and safe investment plan for the long run, this chart shows that the strategy has merit. Part of the performance comes from not just the choice of asset classes to allocate to but the disciplined rebalancing between those asset classes. Unless you are willing to hold all of these asset classes, and sell those which are up and buy those which are low, the strategy probably will not work as indicated. Unfortunately, if you are looking for someone else to be that disciplined investor for you, Cor Capital is currently limited to sophisticated/wholesale investors, which means, for example, an initial investment of $500,000." It has been highlighted to me that this fund is now far more accessible for Australian investors, particularly for those with an interest to buy in through super. You can allocate as little as $1000 to the Cor Capital Fund if you have at least a $5000 super account balance. They have a more in depth brochure available here. On seeing this, my first thought was to take a look through the Cor Capital Fund PDS (cynical I know). A number of risks associated with gold were listed (price risk, government risk e.g. change in laws), but interestingly saw no mention of custodian risk and the only mention of how the gold was held, "Physical gold is held in professional bullion vaults on our behalf." "The Fund precious metals allocation (25% approx.) is currently 99.8% in physical gold and we keep about half in Perth at the Mint and half in Sydney at Custodian Vaults (ABC)." I do like that the fund has a conservative approach even with the storage of it's gold, diversifying across the two companies and locations. I don't have any intention in the near future to move a portion of my super into this fund, however it looks like a reasonable option to consider for those who want to have exposure to gold as part of a diversified portfolio in their super.